After all, most of us grew up imagining that eggs come from happy hens on Old Macdonald’s Farm. You see this image of idyllic small farms full of happy animals pushed in everything from TV advertisements to children’s classrooms so it’s no surprise that so many of us have accepted it as the truth. A lot of animal lovers who eat eggs reason that laying eggs doesn’t hurt the chicken and the eggs aren’t fertilized anyway so it’s not causing any harm. A reasonable assumption. What they don’t realize is that laying hens don’t get to retire when they get older and their egg production starts to slow down, they get slaughtered just like chickens bred for meat do after only a couple years. Therefore when you buy a carton of eggs at the store you’re helping pay for the slaughter of chickens the same way you would be if you were buying meat. Most egg-laying hens on factory farms are crammed into tiny cages called battery cages for their entire lives, they never get to stretch their wings or peck the dirt or do anything that a bird would naturally do. Birds crave movement and mental stimulation just like people do and living in such cramped conditions until they are slaughtered is agony for them. Imagine being trapped on a crowded bus for your entire life and never being able to get out of your seat or move around or stretch your legs, that’s how millions of hens spend their entire lives. Not only are the cages small they are also made of mesh and after spending their entire lives standing on metal grating the birds’ feet often become injured. The cages are also so filthy and crowded that each bird may only get as much floor space as a sheet of letter-size paper, many birds die before they ever make it to the slaughterhouse. Being crammed together into tiny cages for their entire lives causes hens a severe amount of stress and they often react to that stress by pecking at each other, to prevent this they are debeaked. This means that a portion of their beaks are seared off with a hot blade with no anesthetic. A chicken’s beak is filled with nerves and debeaking can result in severe and even chronic pain. 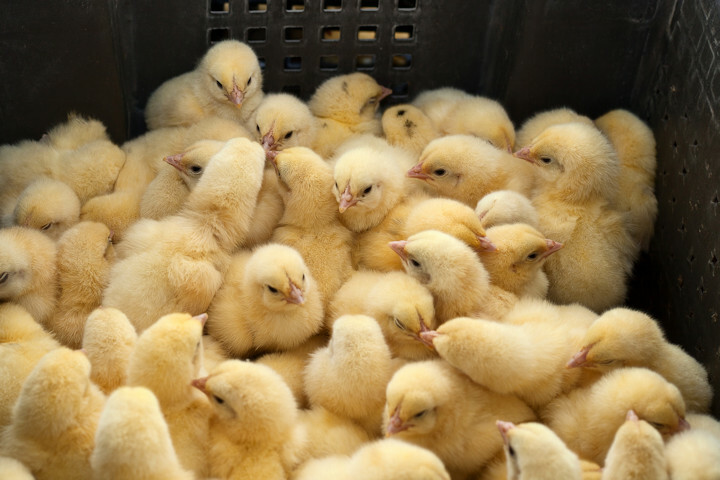 Male chicks are useless to the egg industry so after they are hatched they are culled or in other words killed. Up to 260 million each year are ground up while still alive or suffocated in plastic bags or gassed. Through selective breeding hens have been artificially induced to yield higher egg production than ever before, an egg laying hen now produces over twice as many eggs as they would have a century ago which puts a large amount of stress on their bodies. Labels like free range or cage-free or humane may seem like the answer to the cruelty found on factory farms but these labels are allowed to be very misused by the egg industry. Cage free birds are often crammed into huge warehouses together with barely enough space to move around and no access to the outdoors, while free-range birds often have very limited access to the outdoors and are still debeaked to prevent pecking caused by overcrowding. As awareness of the cruelty associated with factory farming rises the idea of raising chickens in your own backyard is becoming more popular. People reason that if they raise the chickens themselves they can ensure there is no cruelty involved in collecting the eggs. The sad reality is that those backyard chickens have to come from somewhere and they come from commercial hatcheries where the male and “defective” female chicks are still culled and their parents are bred and killed as young adults. Another issue is that a lot of people aren’t prepared for the responsibility and work involved with raising chickens and many end up mistreated or abandoned. There are now so many more egg alternatives than ever before, whether you are craving a breakfast scramble or delicious baked goods and desserts there is the perfect plant-based alternative. With the discovery of aquafaba (fun fact: it’s bean juice!) you can even make egg-free meringue! With so many great alternatives it’s easier than ever to make the compassionate choice and switch to a plant-based diet. Best Vegan Egg Alternatives to Cook With? Palm Oil: Friend or Foe? Is Veganism Compatible with the Keto Diet?